New York, New York! The city filled with busy streets, busy attractions, and even busier people. We think that New York is better when you take your time, slow down, and see all that you can see, especially when it comes to faith based tours. You and your group are going to love this slower paced tour of the city's Catholic based sites, featuring some of the oldest, most influential, and most famous spots in the history of the faith, and in the history of New York City! 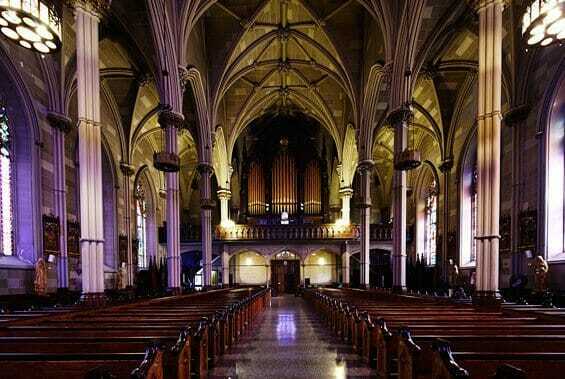 St. Peter’s Church - On this enlightening 6-day Catholic-themed journey through NYC you will have the pleasure of starting each day out at a different iconic local church, starting day 1 out right with iconic St. Peter’s Roman Catholic Church. St. Peter’s has nearly 200 years of history in Lower Manhattan, surviving various riots, pestilence, and attacks amid the surrounding streets. The Roman Catholic parish of Our Lady of Rosary, has a long history of resilience and renewal, sitting at the "center of early American Catholicism" and having long standing connections to several influential Catholic New Yorkers since its inception. St. Peter’s Church actually predates the first Bishopric in the United States, built just two years after the end of the American Revolution! The artwork and architecture here are outstanding, the building itself a Greek Revival masterpiece filled with historic pews, intricate stained glass windows, and gold ornate details around every corner! One World Observatory - Next stop, the iconic One World Observatory, more commonly referred to as Freedom Tower, the massive structure representing resilience and hope. Freedom Tower is the rebuilt One World Trade Center, a structure built in honor of the September 11, 2001 attacks. This stop will provide your group with incredible views, educational experiences, and lessons on our country and this tragedy in detail. Working to help "illuminate the past and showcase the beauty and hope of the future" through various exhibits, a theater, and 360 degree views of the nation’s largest city, the One World Observatory is truly the perfect place to learn all you can about the sobering time in which our nation went from ashes to hope. Not to mention, it's the ultimate place get all the technical details on the tallest building in the western hemisphere (fourth tallest in the world), as well as a quick and educationally immersive ride to the top! 9/11 Memorial and Museum - The National September 11th Memorial and Museum opened on the tenth anniversary of the terrorist attacks in 2011. This monument and building complex commemorates the 2,977 victims of the Twin Towers' collapse and the six victims of the 1993 World Trade Center bombings. An average visit should take you roughly two hours with the entire museum broken up into three different parts: Day of 9/11, Before 9/11, and After 9/11. Throughout each section you will learn all about the Twin Towers, the Pentagon, and Flight 93. The background of each structure and event will be given in detail, as well as the aftermath and its implications. See the Memorial Exhibition before you go, filled with the names of those victims lost to the tragedy, as well as the very last standing column and slurry wall within Foundation Hall. Mass at Shrine of St. Elizabeth - Take in the city sights and smells on your way to the National Shrine of Saint Elizabeth Ann Bayley Seton this morning, the perfect place in NYC to really learn something new and immerse yourself into a truly important historical site! The Shrine of St Elizabeth is located along 7th Street in Lower Manhattan and will provide your group with the amazing story of Elizabeth Seton herself, the incredible woman who was a loving wife, mother, and unfortunate widow by the age of 29. Learn all about her, her family life, and her impact on the nation as foundress of the first Catholic girl's school and the first American chapter of the Sisters of Charity. She provided such a lasting legacy of teaching, giving, and serving that continues today, over 200 years after Saint Elizabeth lived. This is a NYC stop you and your group aren’t going to want to miss! Statue of Liberty & Ellis Island - No visit to New York City would be complete without a trip to our nation's most famous National Monument and World Heritage Site, the Statue of Liberty. Located on Liberty Island, this colossal neoclassical sculpture was brought to America in 1886 as a symbol of friendship between France and the United States following the American Revolution. Designer Bartholdi created this 225 ton structure, with the help of the designer of the Eiffel Tower, as a physical representation of freedom and democracy in America. Ellis Island is famous today for being the portal to over 25 million people, offering up the American dream and opportunities immigrants did not have in their homelands. It was a symbol of life, liberty, and the pursuit of happiness, just like the Statue of Liberty. Visit Ellis Island and learn not only about the history of America, but the history of your own family. Wall Street Tour - Once a fence-like border protecting our country from British invasions (a formal northern boundary of the New Amsterdam settlement), this area is now synonymous with the successful NYC Financial District. What was once a wooden stockade constructed under then Governor Peter Stuyvesant is today a booming and bustling economic haven. Here you and your group will find business being conducted as it has for 225 years. See wooden markers in the cobblestoned street with historic stories waiting to be told as your tour guide shows you all the secret spots in the district that make it so unique and successful! You can try the Wall Street Experience for one of these in-depth tours of the district, or perhaps you and your group would prefer to just take a self- guided walking tour, with several learning materials available to you around the district! Brooklyn Bridge Walk - A walk across the Brooklyn Bridge is an iconic must-do while in New York City, one of the biggest tourist destinations in the area that is also one of the most familiar routes in New York. There is one main decision that must be made before making this iconic trek: do you want to start in Manhattan and walk into Brooklyn, or vice versa? Several people agree that while the walk from Brooklyn to Manhattan provides the overall best skyline-filled iconic views, that both are well worth the experience. Some people even say to get the best views if you are walking from Manhattan walk only halfway, then turn around and catch the skyline that way! The walk across the wooden pedestrian bridge will take about an hour to fully sight-see along the way, being a total of a 1.3 mile walk soaring over the East River. You will see the Statue of Liberty, Governors Island, and Lower Manhattan from here, the best views from the two bridge towers! St. Patrick’s Old Cathedral - Deep within the Nolita neighborhood of Manhattan you will find one of the most unique, historical, and influential Catholic spots in the whole city, the Basilica of Saint Patrick’s Old Cathedral. Established over 200 years ago in 1809, this gorgeous cathedral is considered to be the oldest in the city, much of its intricate architecture restored to the original appearance. The members of the church grow in faith through celebrations of sacrament, community service, and social interaction, supporting the "beacon for Catholic faithful and a symbol of religious freedom in America." While here you and your group will have the chance to attend morning mass at 8 am and then tour the gorgeous building and learn all about the history of the impoverished Irish community that once started this church that has today grown into a multi-ethnic vital force in the Catholic community. Tenement Museum - Located in the Lower East Side, Tenement Museum of New York is a National Historic Site, first built in 1863. Here on site you will see a culturally significant historic home of gorgeous Italianate architecture, once home to over 7,000 working class immigrants. While here you will get a architectural rundown, lesson, and tour of the building itself, as well as learn many interesting personal stories and historic details about who once called this place home. Choose between such group tours as the Guided Tenement Tours, giving views of the place during the 19th and 20th centuries as well as insights into current immigration-related debates; the Neighborhood Walking Tours, or the Teaching Immigrant Experience, in which over 44,000 students have been involved. There are also occasional Tenement Talks, which include free readings, discussions, and performances about New York’s history, people, religion, and culture. Lower East Side Walking Tour - The Lower East Side neighborhood is one of the oldest, most historically significant and complex quarters in all of America. On this Lower East Side Walking Tour your group will see several neighborhoods and enclaves including East Village, Little Italy, the Bowery, and Chinatown. On this journey you will discover a sample of America's great melting pot, a blend of cultural diversity and rich history that is truly unlike any other place in New York. Visit a historical synagogue that is adjacent to a Bulgarian Punk Discotech, check out all the oldest and most new art and architecture throughout the neighborhood, learn about life on each street, master Yiddish phrases, and redefine your palate with world wide treats. This is the best way to immerse yourself in the city of New York, beyond the busy streets and neon signs. Spend your evening in whichever neighborhood section strikes you the most interesting and enjoy some dinner and entertainment! Tour of St. Patrick’s - St. Patrick's Cathedral of Fifth Avenue Manhattan is a magnificent Neo-Gothic construction built by the faithful and persevering community of 19th century New York. The original St. Patrick's Cathedral had grown too old and small to accommodate the growing Catholic faith after the city was made an archdiocese in 1850. Archbishop John Joseph Hughes commissioned a new cathedral to represent the glory of God, and it would be designed by architect James Renwick, Jr. The cornerstone was laid in 1858 though the construction halted due to the Civil War and did not resume until 1865. Finally, the house of worship was finished 1878. Today it's in a prime location along Fifth Avenue, a beautiful and elegant Old World church filled with history, art, music, and architecture. The cathedral offers guided and walk-in tours Monday through Friday and as for Mass, the cathedral and celebrants will welcome you with open arms every day of the week. Rockefeller Tour - Welcome to the Rockefeller Center, the cultural icon that was first envisioned by American business tycoon John D. Rockefeller over a hundred years ago as a “city within a city.” Rockefeller Center is a beautiful building complex with art deco details, historical significance, and entertainment attractions. 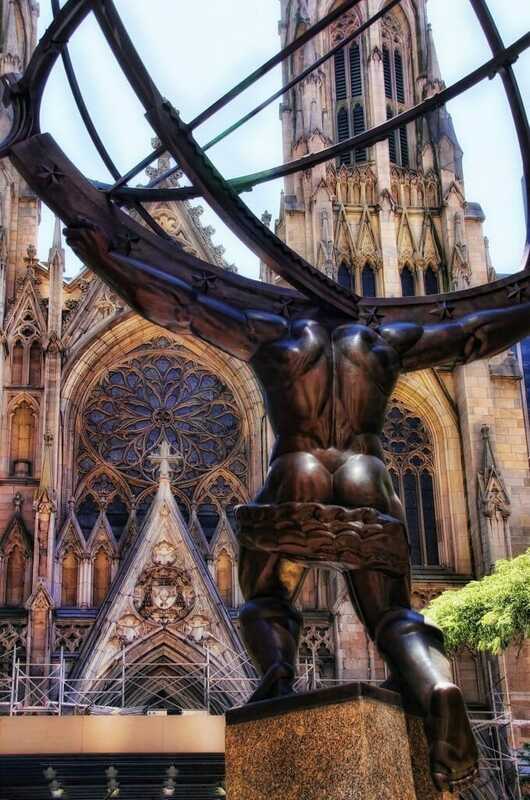 Upon arrival you will first see the well-known statue of the mythical Atlas holding up the world in a representation of Rockefeller’s personal philosophy. During a tour you will see several like artistic features, as well as learn about the several innovations and traditions that have been started here, such as the annual lighting of the Christmas tree and the seasonal skating rink. Visit during the spring and summer months to see the flowers in full bloom in the Channel Gardens and during the winter holidays for the special shows. Grab a bite to eat, an iconic souvenir, or just a great view or photo from the windows of one of the nation’s most iconic buildings! Top of the Rock - For a bird’s eye view of the iconic NYC skyline head up to the top of the Rockefeller Center, to one of NYC’s most famous viewing areas, the Top of the Rock. Take an elevator up to the popular LED-lit top, where you’ll enjoy exhilarating 360-degree views of Central Park and the awe-inspiring panorama of the dazzling city skyline from three observation decks. There will also be an option to stroll over to a comfortable 86th floor stop featuring indoor and outdoor viewing options or climb 200 feet higher to the climate-controlled 102nd floor observation deck – the highest public point in New York City. Both vantage points will offer incredible panoramic views from 1,250 feet above the heart of Manhattan. On a clear day you can see all the way into Pennsylvania, Connecticut, Massachusetts, and New Jersey! Enjoy this once in a lifetime sightseeing opportunity and don’t forget your camera for this stop, you’ll definitely want to capture the moment! Met Cloisters - Start you day off with a visit to Northern Manhattan, to see the unique and informational medieval branch of the Met museum located in Fort Tryon Park. This portion of the famous NYC museum showcases medieval art in a reconstructed French monastery, showing curious guests the cultural and historical wonders of medieval Europe through art, architecture and gardens. Within this amazing building you will find various collections of art and artifacts set against an unbelievable architectural backdrop, with such exhibits being offered as to show you the history and evolution of medieval art, as well as the history and evolution of the Met Museum itself. You will have several different tours to choose from depending on the group size, function, and timing, such as the gardens tour, highlight tour, and campus tour. Before you go be sure to stop and fill your belly at Trie Cafe, where you will find delicious sandwiches, snacks, desserts, beverages, and coffee, all enjoyable outdoors under the intricate arches and French Medieval walkway! St. Frances Xavier Cabrini Shrine - Get ready for another spiritually enlightening morning at St. Frances Xavier Cabrini Shrine. Here, again on a gorgeous wood site in Northern Manhattan, you will find the site houses the most precious remains of the beloved Saint Frances. This area serves as a welcome center for new immigrants and pilgrims of many nationalities, a center to pray and reflect upon Mother Cabrini, her influence, and the Catholic faith. Once here you may tour the chapel, lush grounds, and various meeting spots as you enjoy the details of the buildings metal work, decorative brickwork, stained glass windows, and larger than life mosaics. Attend daily mass and prayer and observe the other daily events happening as well. Most of all, pay homage to Mother Cabrini and reflect upon her wonderful contributions to the human community. The Met -The Met, or Metropolitan Museum of Art, was founded in 1870 by a group of Americans after an artfully inspiring trip to Paris, really craving a cultural landmark comparable to the Louvre. Furnishing artistic understanding, inspiration, and encouragement of developmental creativity are all concepts that blossomed from its establishment in the community, quickly known as one of the largest museums in the world. Be sure to wear comfortable walking shoes to explore the two million square feet of galleries and exhibits, various sections including such highly regarded works as by Rembrandt, Georgia O’Keeffe, Renoir, and El Greco. You will see Vincent Van Gogh work, Leonardo da Vinci, and even five paintings by Picasso. There is actually so much to see here, that it is recommended you plan a tour before visiting, specifically based on the interest of your group and what they desire to see. St. Francis of Assisi - The church of Saint Francis of Assisi is a parish church under the Roman Catholic Archdiocese of New York that sits at West 31st Street in Manhattan. The Order of the Friars Minor staff this church and aid in helping the community with daily prayers, baptisms, marriages, and the like. Here you and your group will find a truly amazing atmosphere to "celebrate mass with a great amount of reverence, dignity, and enlightenment." This church was first established in 1892, a gorgeously authentic Gothic Revival Style structure with intricate details you won’t want to miss in person. Considered to be the National Shrine for Saint Anthony of Padua, this church is also filled with important spiritually historic artifacts and artwork. Mass begins at 7:00 each morning, as well as at 7:45 and 8:30, depending on the day. United Nations Tour - Before you leave NYC you’ll get the chance to tour the impressive 18-acre complex on the East River known as the Headquarters of the United Nations. Established here in New York City in 1952, this international diplomacy center holds 193 member nation seats, a truly amazing place to see and experience. Enjoy international architecture along with international cuisine during your visit, as well as a one hour guided tour that allows you and your group to discover the organization at work, from the General Assembly to the Delegates Dining Room. You will see various photographs and multimedia displays on important topics, such as human rights, sustainable development, malaria, women’s rights worldwide, and children in armed conflict. This is an iconic NY stop that will take you out of the bustling streets of NY and into the forefront of the world! Matinee Broadway Play - Get ready see the stars, literally, as you head to the theatre and choose between several popular NYC Broadway Shows currently playing during their matinee hours. Choose between such titles as The Phantom of the Opera, Les Miserables, Jersey Boys, Chicago, Matilda, Fiddler on the Roof, and so much more. Be sure to get there early and have time to see the theater and find your seat before settling in for one heck of a show. No visit to NYC would be complete without seeing a show on Broadway, and with more than 40 theaters to choose from we assure you there will be something for everyone in your group. Stay after the show to see more of the theater, head to a cafe or gift-shop, or just wait by the stage door for autographs from your favorite Broadway star! What better way to say goodbye to NYC?